1. Giacosa, Ilaria Gozzini, A Taste of Ancient Rome. Anna Herklotz, trans. Chicago: The University of Chicago Press, 1994: 12; Pliny, Natural History, Book XII, vii. 15, who is clear in stating that the fruit is not eaten, so it surely is not the lemon. Also see Andrew M. Watson Agricultural Innovation in the Early Islamic World: The Diffusion of Crops and Farming Techniques, 700-1100. Cambridge: Cambridge University Press, 1983: 42-50. 2. Dalby, Andrew. Siren Feasts: A History of Food and Gastronomy in Greece. London and New York: Routledge. 1996: 144 repeats the view of Tolkowsky, S. Hesperides: A History of the Culture and Use of Citrus Fruits. London: John Bale, Sons and Curnow, 1938: 100-103, which is strange because he has already told the reader that that source is unsound (252 n. 34) and although he seems to be aware of the compelling argument against this notion in Zohary, Daniel and Marcia Hopf. Domestication of Plants in the Old World: The Origin and Spread of Cultivated Plants in West Asia, Europe, and the Nile Valley. Oxford: Clarendon Press, 1988, he does not go further and seems unaware of the argument in Watson 1983. 3. Watson 1983: 42-50; 167 n. 1-171 n. 49. On the controversy about the relationship of this work with the Byzantine Geoponika of the tenth century, see Watson 1983: 221 n. 1. 4. Watson 1983: 46, citing Sarton, George. Introduction to the History of Science. vol. 1: From Homer to Omar Khayyam. Baltimore: William & Wilkins for the Carnegie Institution of Washington, 1927: (2) 432-33. 5. Ashtor, E. "Essai sur l'alimentation des diverses classes sociales dans l'Orient m�di�val," Annales: �conomies. Soci�t�s. Civilisations. vol. 23 no. 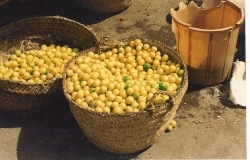 5 (September-October 1968), p. 1041 claims that the Egyptians, although they knew of the lemon, did not yet know it as a popular and drinkable fruit. But the evidence (in the following note) indicates otherwise. 6. Watson 1983: 46, 169 n. 28; Sarton 1927: (1) 468; Goitein, S. D. A Mediterranean Society: The Jewish Communities of the Arab World as Portrayed in the Documents of the Cairo Geniza. Berkeley: University of California Press, 1967 vol. I: Economic Foundations: 121; 428 n. 42.